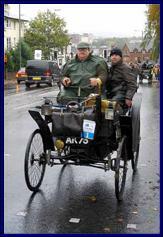 Each year historic vehicle owners are encouraged to support the FBHVC 'Drive It Day' and commemorate the 'Thousand Mile Trial' of 1900, but few, if any, of us know anything about this landmark event. It seems that the only authoritative record is a book 'Thousand Mile Trial' by Elizabeth Bennett, published in 2000 to mark the centenary. Several forms of self-propelled vehicles had been built, tried and tested during the 1890's but the introduction of motor spirit as a propulsion fuel had been a significant step forward. Legislation was soon introduced to limit speed in towns to 8 mph and 12 mph out of town, as well as other restraints. 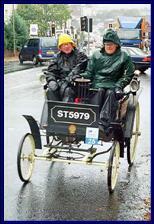 The inaugural London to Brighton Run in November 1896 may have been the birth of the British motor industry, but by the end of the century there were still relatively few motorised vehicles on the roads, the motor-cars being owned and driven by apparently very rich people in flamboyant clothing. Most of the public had not seen a motor-car, and those who had were extremely shocked and frightened, being deeply suspicious of the explosions, noise and smell emitted by the engines, let alone the dust kicked up as these monstrosities moved at great speed amongst the horse-drawn vehicles and pedestrians. The 'Automobile Club of Great Britain' was formed in July 1897 to champion the car and the interests of all motorists but several exhibitions and demonstrations had not gained support for the new mode of transport. The British Motor Industry did not progress as much as the French and German industries in the next few years. In the summer of 1899, the Club Secretary, Claude Johnson, conceived the idea of a trial, to be in the form of a rally rather than a race, which was banned on the highway in Britain. The trial would be a series of daily runs of up to 100 miles that would test the driver's patience and skill, but more importantly the design, construction and reliability of the cars. There would also be exhibitions in the main towns along the way, to try and convince the population of the pleasures and reliability of the motor-car and overcome the prejudices. The Automobile Club Committee was sceptical of this ambitious idea and showed lack of support. However, Alfred Harmsworth, later to be Lord Northcliffe, was very enthusiastic and agreed to provide publicity in his newspapers, to underwrite the costs of the trial to protect the Club from any losses, and to contribute to the prize fund. Within a few months Johnson was able to borrow an 8hp Panhard from Harmsworth, and left London on 16th December 1899 with a mechanic, on a reconnaissance of the route, heading for Bristol. It seems that he followed his mapped route and met officials in the main towns to enlist their support and find locations for exhibitions. It says something of his determination that he decided to check out the route in the mid-winter weather, encountering snow several times, especially on Shap in the Lake District, and damaging the car he was driving in the process. Apparently, after problems with the car, he arrived in Keswick at 1.30am on Christmas morning and knocked up the landlord of The George Inn seeking accommodation!! The 5½hp Daimler was beyond quick repair due to a bent rear-axle and so another Daimler was sent for. He continued to Carlisle and then Edinburgh, before heading south. From Newcastle he was driving yet another car and going by way of York, Harrogate and Leeds, then Bradford and Wakefield he reached Sheffield on 4th January. From there he visited Lincoln, Nottingham, Northampton then south to St Albans and arrived back in London on 5th January 1900, having made the necessary arrangements in every main town and city. The itinerary was now in place for the event to run from April 23rd to May 12th 1900. The final route would comprise 11 days of driving between 61½ and 122¾ miles, the total distance being1060 miles. There would be 4 hill-climb competitions, with Shap being the only optional one, an optional speed trial, with 7 all-day exhibitions, 6 short exhibitions during the day runs and 3 arranged for evenings. The trial was not intended to be a pleasant and leisurely run but a true test of the car and driver under many differing road and weather conditions, with the hill-climbs and speed trial timed and average speeds calculated. In the quaint terminology of the time motoring was referred to as 'the field of automobilism', owners and drivers were either 'automobilists or autocarists', and mechanics were known as 'mechanicians'. The cars were open to the weather even though most had a pram-hood, but no windscreen, which afforded little protection to the driver and passenger, who had to be suitably dressed in 'autocoats', hats and goggles. Apart from detailing the mileages and timings along the route, and finding exhibition venues, Claude Johnson also made the arrangements for breakfast, lunch and afternoon tea stops for each day's journey, with choices of overnight accommodation to meet all levels of comfort and service required by entrants of differing wealth. Baggage wagons were also to be provided. Roadside fuel stations were unknown and with some 250 gallons (c1150 litres) of motor spirit required for each day's run he had contacted stockists in every town on the route, these being general stores, cycle stores and chemists, with several agreeing to provide a supply of spirit at the roadside. The retailers required advanced orders, not later than 1st April, with an accompanying remittance to offset the expense of having to obtain spirit that may not be required. Although most entrants would be accompanied by a mechanic there would also be a need for repair shops. Local organisers would find the numerous marshals for the hill-climbs and speed-trial and each exhibition required stewards. The police forces would be involved throughout to direct the participating cars and local traffic, local and national newspaper editors had to be convinced that the event would be worth advertising and subsequently reporting on. Johnson then prepared a 205 page road book for all entrants setting out, in excellent detail, the plan of each day's route with all the stops for meals, the accommodation in hotels, motor spirit suppliers and repair shops listed with their prices. Hotels would have to be pre-booked by entrants and so the forms were included for doing so. The Rules and Regulations for the Trial were also itemised along with the Fire Regulations for Exhibitions. An official programme was produced by the Automobile Club, price 6d (2.5p) or post free at 10d (5p), with many pages of advertising by the Motor Manufacturers and others. Argent Archer of Kensington, was appointed as the authorised photographer to record as much of the event as possible. Johnson also created a Prize Fund headed by Harmsworth's recently launched 'Daily Mail' offering £150.0.0 for the best overall performance and £10.0.0 for every finisher. Private individuals were invited to subscribe to the fund with a minimum £1.1.0 (£1.05). The Automobile Club de France provided silver-gilt, silver and bronze medals to be awarded to the three vehicles making the best performances in each class. A Mr Ernest Owers agreed to donate a silver cup to the value of £21 for the owner of the most successful amateur entrant. To oversee the event 15 judges were appointed from the highest standings in the Automobile Club and some suitably qualified academics. The trial was advertised and promoted, mainly through Harmsworth's newspapers, and entrants were invited from both the Trade and Private individuals. Anyone making a private entry would have been from the landed gentry, or a successful businessman, as no artisan could afford a car costing several hundred pounds and be able to employ a full time mechanic, let alone meet the cost of participating. Trade and Private entries were divided by the price of the car into several classes: A - £200 or less; B - £200 to £300; C- £300 to £500 and D- more than £500. Class E was for Motor-cycles with section a) for Tricycles with 1 person and b) for Tricycles or Quadricycles for 2 or more persons. Class F was for Public Service vehicles for at least 6 people or an equivalent weight of 10½ stone (65kg) per person in ballast. Each driver would be required to complete a Record Sheet at specified points along the route. Eighty-four entries were forthcoming with 53 Trade and 31 Privateers. At the time the principal British cars were Daimler, Lanchester, Napier and Wolseley and these were well represented with many Panhards, a few Benz, a De Dion, a Peugeot and a Decauville with several other makes now long lost in history. Amongst the Trade entries was Herbert Austin, later to become Lord Austin, driving a 12cwt petrol driven 3½hp water-cooled, belt driven, Wolseley entered by the Wolseley Sheep Shearing Machine Co., Birmingham for whom Austin was the Manager. The smallest cars appear to have been two 3hp 1 cylinder Benz Ideal priced at £173.5.0 (£175.25) entered in the Trade section by Messrs Hewetsons Ltd, who had started to import the cars, driven by Henry Hewetson and a Mr Ernest Coles. Two ladies were passengers but the only lady driver competing was Mrs Louise Bazalgette, in the Private Class, driving a 3hp 1 cylinder Benz Ideal entered by Hewetsons Ltd. Also in this class was the Hon John Scott-Montagu MP, later 2nd Baron Montagu of Beaulieu, driving a 12hp Daimler, the Hon C S Rolls driving a 12hp Panhard and Claude Johnson driving a 6hp Daimler. Alfred Harmsworth entered a 12hp Panhard and a 6hp Daimler in this class but was not a nominated driver opting to drive only on a few sections of the route. All entrants were expected to participate in an exhibition at the Agricultural Hall, Islington from Saturday 14th April to Saturday 21st April with the price of admission at 1/- (5p). The 22nd was inspection day by the judges so that all competing vehicles could be passed and stamped in various places. Unfortunately the problem was that apart from a couple of Accessory Agents no exhibitor showed that described in the catalogue whilst some entrants were still preparing their cars and had not exhibited them. A few spare parts were carried in the cars but with a lack of storage space personal luggage was taken on the baggage wagons. Sixty-four vehicles, 43 of the 53 Trade entrants and 21 of the 31 Private entrants (a Trade and Private entrant both joined in later), left the start in Grosvenor Place, London at 7am on Monday 23rd April, for the 118½ miles to Bristol along the old A4 hoping to arrive by 7pm. Sixty cars reached Bristol to exhibit in the Drill Hall on the 24th. Naturally drivers were urged to obey the speed limits, despite the average speed for the trial being 12 mph which was also the legal limit outside towns. Inevitably the police, rather suspicious of mechanically propelled vehicles, had to be out on the fast, straight road sections with Berkshire Police soon upsetting a few drivers, despite the now familiar plea that the road was free of other traffic and there was no danger to anyone. On Wednesday 25th it was also a 7am start from Bristol and by the time the cars arrived in Cheltenham about 1.30pm 58 vehicles took part in an exhibition until departing at 3pm via Worcester to Birmingham after a 92½ mile run. Following a full day exhibition in the Bingley Hall 59 cars left Birmingham at 7am on Thursday 26th, as one entrant had joined the trial late but went only a little distance, and 52 arrived in Manchester around mid-evening. On the way the first hill-climb test, Taddington Hill, was climbed at speeds ranging from 18.9mph by a Trade entry Ariel Tricycle, the Hon Scott-Montagu's Daimler went up at 11.19mph and Herbert Austin's Wolseley made it at 10.08mph, to the slowest being the Private entry Brown-Whitney steam car achieving 4.56mph. The weather to here had been generally cold and dry, but Manchester was wet. After two nights there, including another day-long exhibition at the Botanical Gardens, Old Trafford, they left at 7am on Monday 30th April to complete the 73¾ miles to Kendal by 9pm, and then they had an evening exhibition. On the way the optional hill-climb over Shap Fell, considered to be the worst hill in England, was split into 7¼ miles and 13/8 mile sections. Twenty seven entrants, 19 Trade and the rest Private, attempted the test. The fastest car, a Panhard, made it at 13.29mph in a time of 5mins 20secs, but Herbert Austin could only do 6.12mph taking 12 mins 53secs with his Wolseley, but was still 9th fastest overall. The start on 1st May was not until 9.30am as the 61½ mile run to Carlisle would be the shortest of the trial, and included the hill-climb at Dunmail Raise which was taken in better weather. Forty nine cars are listed as having completed the test with the Hon C S Rolls' 12hp Panhard covering the 1¾ mile climb in 5mins 49secs at 17.06mph. The Herbert Austin Wolseley made it in 13mins 13secs averaging 7.9mph whilst the Hon Scott-Montagu was up in 19mins 20secs at 5.26 mph. The exhibition in the evening of 1st May was in the Butter Market. Another 9.30am start on Wednesday 2nd May took them through Lockerbie to Moffat with deteriorating weather bringing much rain, the speed limit on the open road in Scotland being 10mph. The next hill-climb was the 2 miles from Moffat to Birkhill, and the Private entry of the Hon C S Rolls was again fastest with an average speed of 16.0mph. It was then via Peebles to Edinburgh where, after 100 miles, 51 of the 64 starters arrived about 8.30pm and prepared for the exhibition in Waverley Market Hall on the 3rd, opened by the Lord Provost. Each day had seen the inevitable problems being experienced by most entrants, be it pneumatic tyres and brakes failing, engines overheating or giving up, drive belts and chains breaking, gear boxes seizing. The more major repair work was often undertaken away from the public eye, and when mentioned was played down, for fear of giving the wrong impressions. Despite that most drivers and mechanics sorted things out and kept their car going, some arriving at the next town very late and even the following day. Some met problems ascending hills, with passengers being requested to alight and push. Several of the early retirements were cars that were underpowered and not strong enough for an event so arduous. The public was catching the mood and many willingly helped cars on their way, the police were recorded as being extremely helpful and encouraging the drivers forward. Many folk lined the roads and viewed the exhibitions; the event had caught the public eye. With more wet weather on Friday 4th May the trial now headed south from Edinburgh at 7am for 121½ miles through Dunbar, Berwick and Morpeth to Newcastle, arriving around 7.30pm. There was another full day exhibition in the Cambridge Drill Hall on 5th May with a rest day on the Sunday. Monday 7th May saw the cars depart at 7am in sunshine to go by way of Durham, Darlington, Northallerton and Thirsk to York, for a short exhibition in the gardens of the Railway Hotel, before going onto Leeds where they were scheduled to arrive at 7.45pm. There was another full day exhibition in the Drill Hall Tuesday 8th. The overnight rain had cleared, but the winds were raw cold as they set off at 7am on the Wednesday on the next stage of 74 miles via Harrogate for a short exhibition whilst the drivers enjoyed breakfast. Then continuing to Bradford for a lunch-time exhibition, the afternoon drive through Wakefield and Barnsley to Sheffield for a 6.30pm arrival, after a 74 mile drive, and prepare for the exhibition in the Norfolk Drill Hall on Thursday 10th May. The Sheffield to Nottingham section, on Friday 11th May, was another 7am start with the morning including the optional flying start speed-trial at Welbeck Park, courtesy of the Duke of Portland, with the number of vehicles permitted to take part being limited and entry was required before the Sheffield halt. Several chose not to participate for fear of damaging their cars and not being able to reach London. The weather was dull but fortunately no rain as the test was undertaken in both directions, with uphill and downhill times being recorded and averaged. Again the Hon C S Rolls was fastest going up in 1min 46.60secs and down in 1min 24.75secs to give a mean of 1min 35.60secs in his Panhard. Herbert Austin was placed 9th with a mean of 2mins 37.80secs for the Wolseley. The cars then continued through Clumber Park to Lincoln for a short lunch-time exhibition in St Swithin's Square, before going through Newark to Nottingham, covering 82¼ miles by 7pm before an evening exhibition at the Repository. The weather on the last day, Saturday 12th May, was the worst of the event with a bitterly cold east wind and rain as they set off at 7am on a 25 mile drive before stopping for breakfast at Leicester whilst the cars were again on display. Then it was off to Northampton for lunch, then via Dunstable on the A5 St Albans for the end of the timed part of the trial and to have a meal, some had arrived an hour or so earlier than expected. The cars then processed into London Marble Arch and to Whitehall where thirty-three cars lined up at the display at around 7pm on Saturday 12th May, after the last 122¾ miles of the trial. After an early start, every day's run had a tight time schedule to arrive for meal stops along the route, arriving after a 12 hour journey to prepare the cars for an exhibition that evening or the following day. There must have been a great deal of pressure on the mechanics working during the meal stops and well into the nights to keep the cars running and well presented, as drivers were determined to finish and wanted to make the right impression on the sceptical public. According to the official record 47 cars, 31 Trade and 16 Private, finished on the Saturday night as intended. Of these 35 were considered to have completed the whole trial achieving full average speed throughout. The Hon C S Rolls gained the overall prize and the Owers Cup for the best Private entrant. Herbert Austin finished 1st in Trade Class C, managing full average speed on all but one of the sections, and received the French Club's silver medal, £31.3.8 (£31.18) from the prize fund as well as the £10 finishers award. Both 3hp 1 cylinder Benz in the Trade class finished and, although both were below average speed on only 2 and 3 sections, the car driven by Ernest Coles won the class and received £31.3.8 and the finishers prize of £10 awarded to both cars. The Hon John Scott-Montagu finished having achieved full speed throughout the trial, gaining a bronze medal and silver cup, whilst Mrs Bazalgette, who was below average speed on eight of the sections, received a silver medal and bracelet. Each nominated driver received a certificate at the prize presentation and dinner later in the year. Several mechanics had shared the driving and were also awarded certificates in recognition of their very significant contribution to the trial. The drivers and their mechanics had showed great determination, fortitude and resilience, with their pioneering spirit venturing into the unknown, taking the poor weather and road conditions as these came. They had overcome breakdowns and effected repairs, often not in the best places to do the work, and in some cases had had to make extensive modifications, but that is the nature of development and a benefit from an arduous and testing trial. The cars survived the steep hills and descents, they had shown speed and a high degree of reliability, and demonstrated that British cars were catching up with those developed in France as 75% of the 15 which dropped out of the trial were foreign. A few animals were disturbed by the passage and noise of the cars but it appears that incidents were relatively minor and there were no fatal accidents. All along the route many Mayors had given the cars an official welcome to their town, others displayed their private prejudice and declined to be involved, crowds had looked on and cheered, brass bands had played. The Motor-Car Journal produced a fully illustrated record of the trial and much press coverage had been achieved in all the towns and cities, whilst the national press at home and abroad provided much coverage of the event. The meticulous and high standard of organisation before and during the trial is unbelievable, and is equal to that required for any modern-day international event. The trial can only be considered as a truly epic and landmark event demonstrating that the car was to be of great benefit to everyone, and having enlightened the public into accepting the arrival of motorised transport in preference to horse-drawn vehicles. Pre-conceived ideas and suspicions, the ridicule, fears and expected dangers surrounding these fast moving machines had been laid to rest in many minds. Those who had taken part had established the right to drive their motor-cars on the highway. The greatest outcome was probably the subsequent more rapid development of cars by the British manufacturers. Steam cars were now obsolete and horse-drawn transport would soon be in decline, tiller steering and solid tyres would be replaced by the steering wheel and pneumatic tyres; hot tube ignition, belt and chain transmission systems and single cylinder engines would soon be superseded and continual improvement in all aspects of motor-car design, construction and performance would be common place. Some of the competitors would soon establish their own motor manufacturing empires. Supporting this progress would be motor dealers and concessionaires, and many new ancillary industries with roadside fuel stations, garages and repairers in towns and villages, the coming of the RAC and AA with their breakdown assistance from the man with a motor-cycle and sidecar, the insurance industry, suppliers of clothing and maps, those manufacturing spare parts and bolt-on accessories, regalia and so many more. The British Motor Industry was taking off, and Parliament was soon encouraging the development and use of self-propelled motorised transport by raising the speed limits, introducing legislation on the construction and use of vehicles, developing the registration and licensing systems, whilst inevitably introducing powers for driving offences. Despite the success of this landmark event in the history of the British Motor Industry awakening the public and Parliament to the motor-car, so very few of us have ever heard of it. Everyone has heard of the annual London to Brighton Run celebrated as the oldest motoring event in the world and well publicised. The Thousand Mile Trial was re-enacted on the 50th, 60th and 70th anniversaries, when St. John Cousins Nixon, who was a 14 year old mechanic on the original trial, drove Herbert Austin's Wolseley over the same route on each occasion. It was also re-enacted in 2000 and even then we do not recall hearing of it. 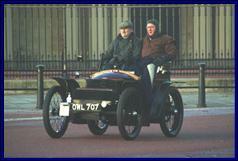 The 3½hp Wolseley driven by Herbert Austin, now registered as OWL 707, is regularly used on the London to Brighton Run, and with the Hon John Scott-Montagu 12hp Daimler, are amongst a few that have survived and are in the National Motor Museum at Beaulieu. So it is very fitting that those of us privileged to own and drive a 'modern' historic vehicle should celebrate, and commemorate this momentous event in our motoring history each year on the nearest Sunday to 23rd April. Photos: To show the cars of the time of the Thousand Mile Trial the photos are from the 2002 London to Brighton Run at www.svvs.org/gallery-brighton5.shtml whose copyright is fully respected. No 3: AR 75 is a Peugeot. One was entered in the Private Class but did not finish. This article was prepared by Doug Castle in March 2007 to inform Club members, and others, about the 1000 Mile Trial which we commemorate each year on 'Drive it Day' held on the Sunday nearest to 23 April.